Take the Green line to Xindian MRT station (the last stop south), leave through the only exit and find the bus stop on the right hand side of the station, on Beitou Road. Take bus 849 to the last stop. At the weekend the bus will be very crowded, and you probably won't get a seat. It's also a twisty, windy road so you might find the bus trip a little uncomfortable, or extremely fun! 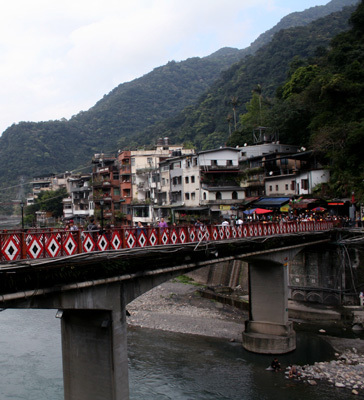 Wulai is a pretty tourist town with a river running through the middle and high bridges to cross it. As you would expect from a tourist town there are many little restaurants and shops selling local products and food. I would recommend the Zhutong Fan (竹筒飯), rice with beans cooked in a bamboo tube. 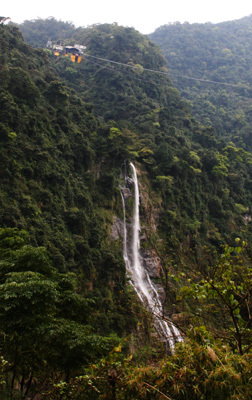 About a thirty minute walk from the bus stop there’s a waterfall (follow the signs and the road that goes right through town) and a cable car which takes you above it. If you feel more adventurous there are walks and hikes going into the mountains. 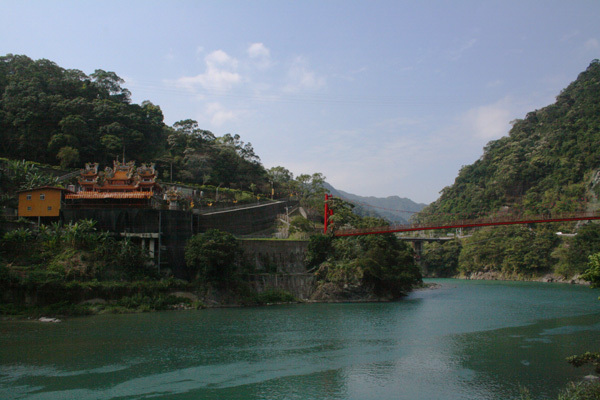 Wulai also has some free hotsprings by the river, but they are crowded and relatively small. I would recommend stopping somewhere like this either on the way there, or on the way back.